Are some wines better than others, or are there only wines that you like and wines that you don’t like? Find out on Nov 13, as Mark Censits, Cornell alum and Proprietor of award-winning wine shop CoolVines, takes you on a tour of your personal wine palate. You’ll taste your way through a broad array of wines of all different styles from all over the world. You’ll learn what “off-dry” means, what tannins taste – or feel – like, what “terroir” is. In short, you’ll learn the major factors that make wines taste different, and begin to identify your own personal wine palate. This is the perfect way to get yourself excited for the Triangle Show later in the evening; we will gather from 6-8PM at Princeton's newly constructed Community House, an organization committed to closing the minority achievement gap in Princeton. Community House is located at 58 Prospect Ave and provides programs that bolster early childhood literacy, promote the mastery of fundamental academic skills, and create early awareness of post-secondary opportunities for underserved minority youth. Please arrive as close to 6 as possible, the first glass of wine will be served upon arrival and the program will begin promptly at 6:30 to get theatergoers out in time to make it to the Triangle show - Store Trek; The Out-of-this World Shopping Spectacular (who but triangle would boldly go where no musical-comedy has gone before?). Refreshments will be served. The Princeton Area Alumni Association is excited to encourage post-graduate camaraderie and social opportunities, but we need your help! If you are not already a member, please consider joining us by paying your annual dues. Info can be found here. On October 3rd, PA3's Kristin, Lydia, Reilly and Bettina braved the rain and set up a booth at Princeton University's Community and Staff day. 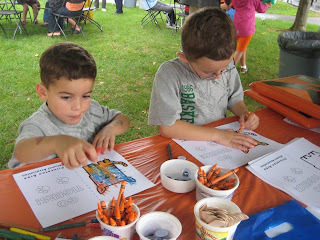 Kids of various ages stopped by to color their own sign with the PA3 logo on one side and "Go Tigers!" on the other. You may have seen them being waved during the game! Join us for a Tiger Tasting at the Rocky Hill Inn on Thursday October 15, 2009 to celebrate Oktoberfest. 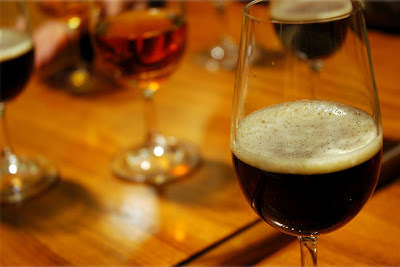 PA3 members and their guests will meet to enjoy a selection of beers and delicious food pairings created for us by the Tavern’s Executive Chef and Proprietor. Come and mingle with fellow alumni, learn something new about the art of beer brewing and take a stroll through the historic Inn to see its collection of historical local photographs as well as documents signed by Abraham Lincoln. Cost to attend is $30 for dues-paying members and guests (limit 2 guests at this reduced price, please) and $40 for others. Please pre-pay below via secure Paypal or email Lydia (lydia@zaininger.com) to coordinate payment. Space is limited and we need to coordinate with the restaurant. The last event was a resounding success, you wont want to miss this. Please let us know if you'd like to attend. Thank you to all the alumni who came to the tutoring information session at Community House on September 23 and/or the observation and scheduling session on October 8. It's not too late to get involved. We have been asked to provide middle- and high-school homework help on dates when undergraduates are away on break or busy with exams while the Princeton Regional Schools are in session. If you are available to tutor on any or all of these dates, please contact Marjorie Young, Director of Community House, at may@princeton.edu to let her know. Tutoring takes place at Community House, 58 Prospect Avenue, Princeton. Marjorie also welcomes input from alumni with expertise in curriculum development, program design, or other areas relevant to Community House programs. If you have knowledge or skills to share, please feel free to contact her. 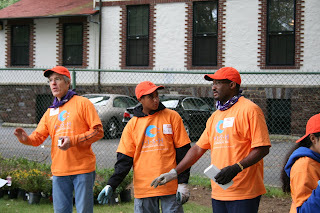 A dozen alums and kids joined Princeton students and community members to build a playground at the Princeton YM/YWCA on September 26, 2009.